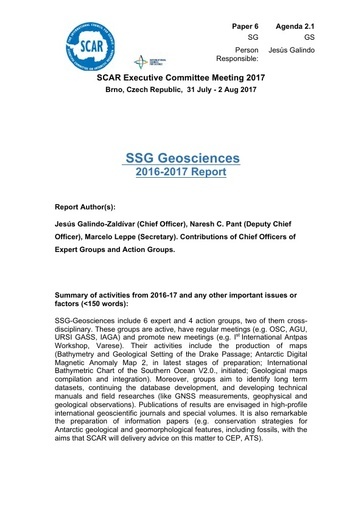 SSG-Geosciences include 6 expert and 4 action groups, two of them cross- disciplinary. These groups are active, have regular meetings (e.g. OSC, AGU, URSI GASS, IAGA) and promote new meetings (e.g. Ist International Antpas Workshop, Varese). Their activities include the production of maps (Bathymetry and Geological Setting of the Drake Passage; Antarctic Digital Magnetic Anomaly Map 2, in latest stages of preparation; International Bathymetric Chart of the Southern Ocean V2.0., initiated; Geological maps compilation and integration). Moreover, groups aim to identify long term datasets, continuing the database development, and developing technical manuals and field researches (like GNSS measurements, geophysical and geological observations). Publications of results are envisaged in high-profile international geoscientific journals and special volumes. It is also remarkable the preparation of information papers (e.g. conservation strategies for Antarctic geological and geomorphological features, including fossils, with the aims that SCAR will delivery advice on this matter to CEP, ATS).